Austria possesses literally hundreds of ski resorts - yet different nationalities seem to return over the years to a small range of favourite areas. Many North Americans will head for the historically famous ski resorts of Kitzbühel and St Anton. The larger regional capitals of Salzburg and Innsbruck are also popular with visitors tending to use them as a central base. The British and Irish appear to have a wider range of destinations, helped of course by a more extensive choice of charter flights and package holidays. But destinations such as Westendorf, Söll and Zell am See hold an enduring fascination, despite the availability of other resorts which may be just as attractive but suffer from the lack of reputation. Things are changing fast, however, with the expansion of the cheaper scheduled air carriers to the airports closer to the ski areas, the extension of holiday charters to midweek flights, and the slow realisation of the country′s hoteliers that there is a market for holidays that don′t run from weekend to weekend. More adventurous expert and advanced skiers from North America will have visited the popular European favourites of Ischgl in the Tyrol or Saalbach-Hinterglemm in Salzburg. But it is rare to hear English in the three villages of the Serfaus-Fiss-Ladis area. High on a sunny plateau with a similar journey time from Innsbruck airport as St Anton and Ischgl, the extensive ski area offers plenty of groomed runs as well as tremendous opportunities in fresh powder. And, for those looking for something out of the ordinary, Serfaus boasts the only underground railway system in a ski resort! In seasons where the snow is not as plentiful as normal, the usual recourse is to head for a resort with a glacier nearby, such as Sölden, Neustift or Mayrhofen. 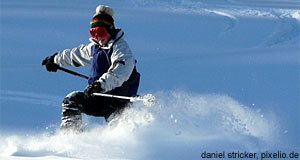 British and Irish skiers may have heard of Obergurgl - North Americans should mark it down in their diaries. Obergurgl is situated at the end of the Ötz valley near the border with Italy. The glacier resort of Sölden down the same valley tends to take all the day trippers, while the small resort of Obergurgl boasts a medium-sized ski area which starts at nearly 2000m altitude and rarely suffers from lift queues. Another resort close to Innsbruck which profits from the high altitude is the smaller ski tourers′ favourite of Kühtai. Just don′t expect a rocking nightlife in either resort. With the growth in popularity of flights booked independently, hiring one′s own car for the ski holiday has also become an option. Not only does it help with organising transport from the airport, it means that collections of resorts on the same ski pass become more attractive. In the Tyrol, the Kitzbühel Alps area pass now covers the large Kitzbühel area itself, the resorts of the Wilder Kaiser (the largest interlinked area in the country), Alpbach and the Wildschönau lifts of Niederau and Auffach. Meanwhile, in Salzburg and Styria, the Ski Amadé pass covers an unbelievable range of 28 ski villages including four top ski areas with a substantial number of interlinked resorts and runs. Steve Rout is an ex-journalist and a qualified ski instructor and mountain walking guide. He owns and writes for the popular Ski-Austria independent guide to the country′s ski resorts, where you can read more about resorts like Serfaus and Obergurgl.